In a special meeting Tuesday night, the Eureka City Council will promise to never again do something that it won't admit to having done in the first place. As it's phrased in the agenda, the council is scheduled to adopt a resolution "of unconditional commitment to cease, desist, and not repeat past action that is alleged to have violated the Brown Act." This grammatically dubious promise stems from a very strange July 16 meeting of the Mayors City Select Committee of the North Coast Railroad Authority. 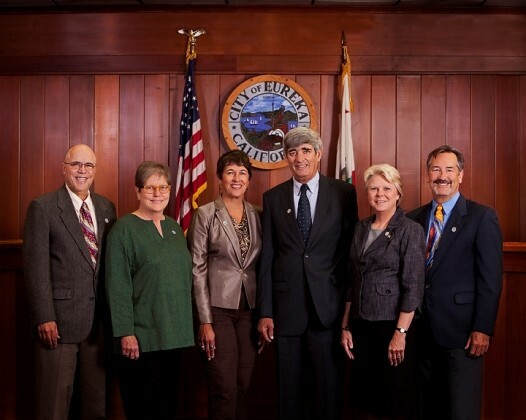 At said meeting, Eureka City Councilmember Mike Newman, acting as mayor pro tem, voted with the majority to boot rail pragmatist Alex Stillman from the NCRA board and replace her with choo-choo fantasist Fortuna Mayor Doug Strehl. During the meeting and in subsequent interviews, Newman said the Eureka City Council had discussed the issue and guided his vote. Specifically he said, "Our council was in discussion, and we were behind the appointment of Doug Strehl ... . [T]he majority of the council was in agreement with, um, having Doug." Trouble is, there was no public discussion of the matter at any public meetings of the Eureka City Council. (California's Brown Act states that public business must be done in public.) Asked later for an explanation, Newman changed his story, then changed it again — first saying that Jager had spoken to each councilmember individually and then, after being reminded that that, too, would violate the Brown Act, saying Jager, who'd previously voted for Stillman, simply changed his mind and sent Newman in his stead to save face. Fellow Councilmember Linda Atkins even speculated that the council may have violated the Brown Act. Regardless, tomorrow night, the council will promise to never again do whatever anyone might think they did to violate the Brown Act. The resolution comes in response to a legal claim filed by Eureka resident Dale Preston, and according to the Times-Standard, the linguistic dodge will "allow the council to avoid litigation without admitting wrongdoing." Note: This post has been updated to clarify Newman's role as mayor pro tem.